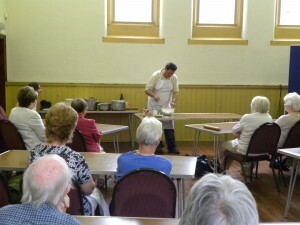 Holiday at Home consists of three days of hands on activities and interesting speakers for the over 55′s. There is a relaxed holiday atmosphere and most people enjoy the full three days, although people may attend individual sessions if they wish. Each day consists of tea/coffee on arrival, morning activity/speaker, lunch, afternoon activity/speaker, tea/coffee and epilogue. Holiday at Home takes place annually, usually in May or June. Click here for more photos. Dominic Nicosia giving a pizza making demonstration while his audience eagerly wait to have a go themselves!